For five seasons, Timothy Olyphant has redefined the 21st-century lawman as cool-as-can-be U.S. Marshal Raylan Givens on the FX series Justified. Tonight, the show—based on a short story by the late, great Elmore Leonard, who also served as an executive producer—will begin its sixth and final season. If the previous five seasons are any indication, it’s fair to assume that there will be a body count when Raylan tips his Stetson for the final time. Here are 21 things you might not know about Graham Yost’s Emmy-winning series. 1. RAYLAN GIVENS EXISTED BEFORE JUSTIFIED. Though Justified, and its pilot episode in particular, is based on Elmore Leonard’s 2001 short story "Fire in the Hole," Raylan Givens made his literary debut in 1993, as a character in Leonard’s novel Pronto, and again in 1995’s Riding the Rap. 2. STEVEN SEAGAL IS RESPONSIBLE FOR THE SERIES’ TITLE. 3. 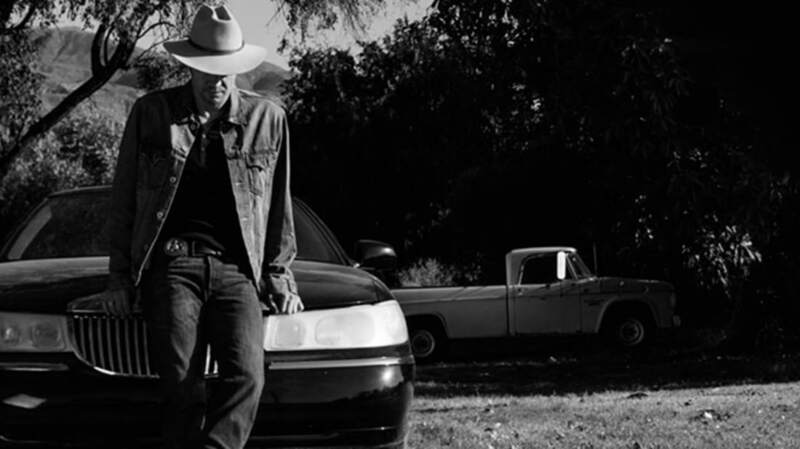 EVEN BEFORE JUSTIFIED, LEONARD WAS ONE OF YOST’S BIGGEST INFLUENCES. “Elmore was an influence—or at least someone I aspired to emulate—even before Justified,” Yost told TV Dudes when asked about the writers that inspired him. 4. YOST GOT HIS START ON HEY DUDE. 5. YOST ALSO WROTE FOR FULL HOUSE. 6. LEONARD WAS A FAN OF OLYPHANT’S PORTRAYAL. 7. OLYPHANT ISN’T THE FIRST ACTOR TO PORTRAY RAYLAN GIVENS. James LeGros got there first, playing Raylan Givens in the 1997 TV movie adaptation of Pronto. And LeGros has popped up on Justified, too: In 2011, he began a recurring role as small-potato criminal Wade Messer. 8. NICK SEARCY WAS THE FIRST CHOICE FOR ART MULLEN. 9. WALTON GOGGINS HAD TO BE CONVINCED TO PLAY BOYD CROWDER. 10. BOYD WASN’T SUPPOSED TO SURVIVE THE FIRST EPISODE. 11. THERE WAS NO ARLO IN "FIRE IN THE HOLE." 12. TO GET LEONARD’S VOICE RIGHT, THE WRITERS BECAME READERS. 13. LEONARD ENVISIONED RAYLAN WITH A SMALLER HAT. 14. THERE IS ONLY ONE BACKUP FOR THE HAT ON SET AT ANY GIVEN TIME. 15. YOU CAN BUY YOUR VERY OWN RAYLAN HAT. Want to channel your inner U.S. Marshal? A replica of Raylan’s hat can be yours—for the price of $144.95—at FX’s online shop. 16. GOGGINS IS AN OSCAR WINNER. Though he was nominated for an Emmy in 2011 for his work on Justified, Walton Goggins has already got the ultimate golden guy on his bookshelf: an Oscar, which he won in 2002 for The Accountant, a short film he co-produced and starred in that took home the Academy Award for Best Live Action Short Film. 17. OLYPHANT CLAIMS TO BE DOING HIS BEST SAM ELLIOTT IMPRESSION. 18. IT WAS YOST AND OLYPHANT’S IDEA TO END THE SERIES WITH SIX SEASONS. 19. THE FINAL SEASON WILL BRING THE SERIES FULL CIRCLE. 20. THE WORLD IS NOW FULL OF RAYLANS. In 2011, Raylan—the name—made its way into the real world when it became the 699th most common name for newborn boys. Its rank rose to 535 in 2012 and 510 in 2013. It doubles as a girl’s name, too, though for every 15 boys named Raylan there is just one girl. Some fans of the show have opted for a softer Rae-Lynn. The name came from a real-life Raylan that Leonard met. 21. EVEN OLYPHANT ISN’T SURE WHETHER RAYLAN IS A GOOD GUY.